Plants red to purplish, flat, foliose, orbicular to irregular in outline often with somewhat dentate margin, up to -30 cm in diameter but usually smaller, about 250-300 µm thick, smooth, slippery, attached by discoid holdfast. Structure of anticlinal rows of branched cortical filaments and medulla of interwoven filaments that occupies half to two thirds of thallus thickness: cells of outer cortical layer about 5 µm long, slightly elongated, cells of inner cortical layer round to ovoid and about 5 µm µm in diameter. Medullary filaments aligned transversely or obliquely from cortex to cortex and surrounded by gelatinous sheaths, somewhat variable in density and direction. Tetrasporangia scattered abundantly in outer cortical layers of both surfaces of thallus, cruciately to decussately divided, about 25 µm long. Cystocarps embedded in thallus, about 180 µm in diameter, apparently without ostiole. Recorded from Tsitsikamma to Qolora River, Transkei (31-42). Epilithic in the lower eulittoral to sublittoral fringe. World distribution: Endemic to South Africa. Type locality: Port Alfred (Silva et al. 1996). Note 1: This species (as Aeodes ulvoidea) is described in detail by Chiang (1970). Note 2: This entity was transferred from the genus Aeodes to the genus Pachymenia by Russell et al (2009) along with the west coast A. orbitosa, leaving only one (New Zealand) species in Aeodes. Note 3: There are a number of specimens in BOL of an entity with the invalid name Aeodes digitata F. Schmitz (see Delf & Michell 1921: 117) from the Eastern Cape (mainly Port Alfred). These are similar in shape and size, but different in texture and colour, to the west coast species Pachymenia carnosa (J.Agardh) J. Agardh. 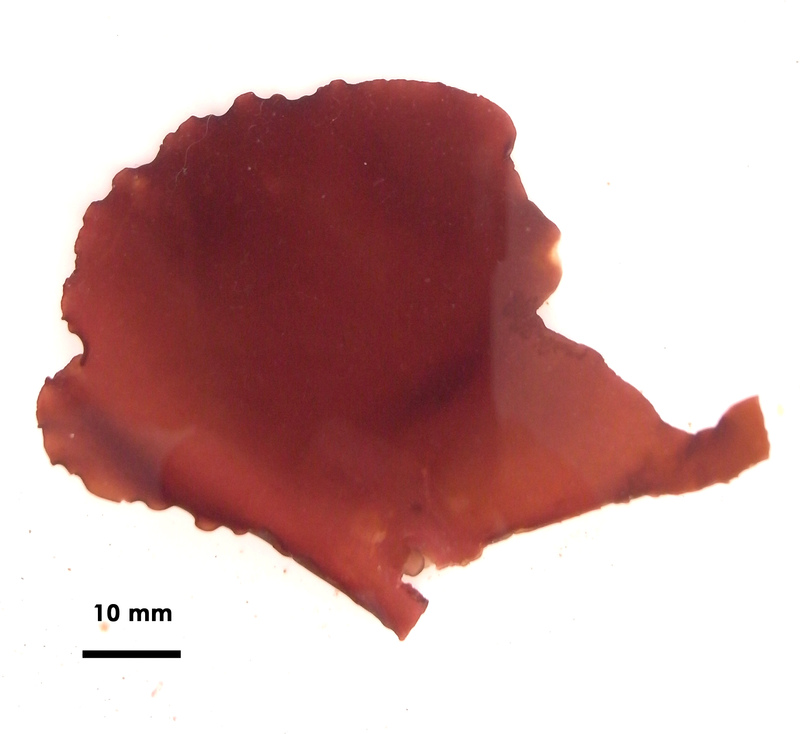 While P. carnosa is dark red, thick, cartilaginous and does not adhere to paper when pressed, these specimens are light red, very thin and completely adherent. We have not collected specimens similar to “A. digitata”, which needs further investigation. Pachymenia ulvoidea, lectotype specimen, Port Alfred (BOL). Pachymenia ulvoidea, Port Alfred (BOL). Pachymenia ulvoidea, fresh specimen, Double Mouth. Chiang, Y-M. 1970. 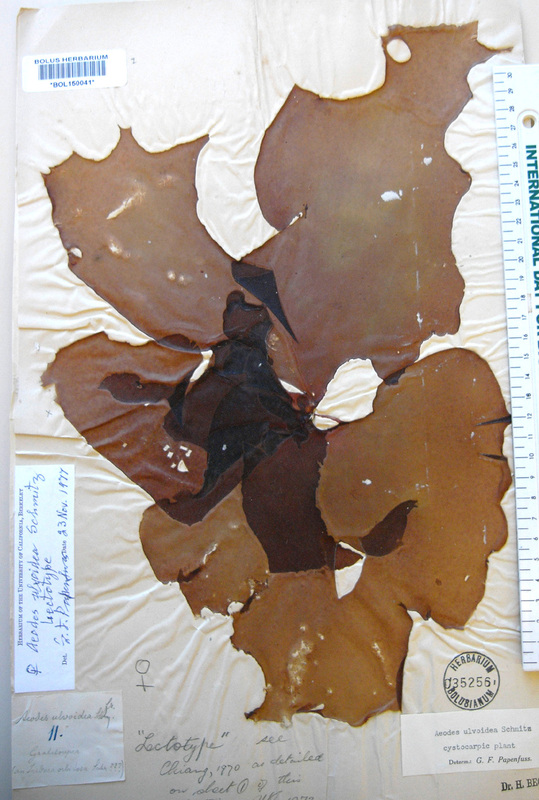 Morphological studies of red algae of the family Cryptonemiaceae. University of California Publications in Botany 58: 95 pp. Delf, E. M. & Michell, M. 1921. The Tyson collection of marine algae. Annals of the Bolus Herbarium 3(2): 89-119. Russell, L. K., Hurd, C. L., Nelson. W.A. & J. E. Broom 2009. 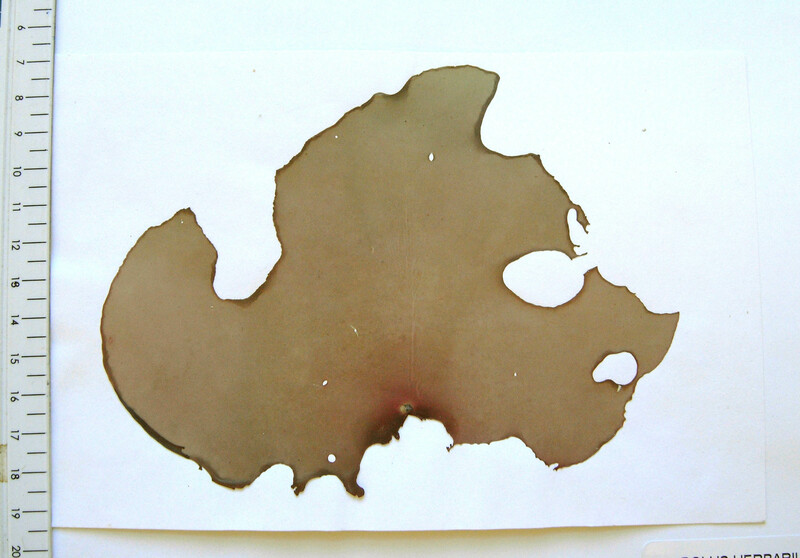 An examination of Pachymenia and Aeodes (Halymeniaceae, Rhodophyta) in New Zealand and the transfer of two species of Aeodes in South Africa to Pachymenia. Journal of Phycology 45: 1389-1399.